Bust:85cm/33.5" Shoulder:36cm/14.2" Sleeve:57cm/22.4" Waist:66cm/26.0" Length:101cm/39.8"
Bust:90cm/35.4" Shoulder:37cm/14.6" Sleeve:58cm/22.8" Waist:71cm/28.0" Length:102cm/40.2"
Bust:95cm/37.4" Shoulder:38cm/15.0" Sleeve:59cm/23.2" Waist:76cm/29.9" Length:103cm/40.6"
Bust:103cm/40.6" Shoulder:40cm/15.8" Sleeve:60cm/23.6" Waist:84cm/33.1" Length:105cm/41.4"
Bust:110cm/43.3" Shoulder:42cm/16.6" Sleeve:61cm/24.0" Waist:92cm/36.2" Length:107cm/42.2"
♥Please allow 1-2cm measuring deviation due to manual measurement. ♥There might be slight difference in color due to computer monitor settings. ♥If any problems about our items, please contact us, we will provide our best service to resolve your issues. ♥♥If you are satisfied with our products and services, please leave your positive feedback~ Thank you! ✿Material: Cotton & lace.✿✿Soft, breathable, lightweight and comfortable fabric, great for daily casual wearing and outings. womens dress womens dresses for wedding womens dresses for work womens dresses long sleeve womens dresses special occasion womens dresses plus size womens dresses fall womens dresses casual summer womens dresses with pockets womens dresses casual. ♥Size: S-XXL. ♥♥ Please refer to the size chart below in product description carefully before you order.Recommended to choose 1-2 sizes up than usual for more loose fitting. women's long sleeve casual loose t-shirt dress women's short sleeve loose plain maxi dresses casual long dresses pockets women's casual plain simple t-shirt loose dress women's casual plain fit flowy simple swing t-shirt loose tunic dress. 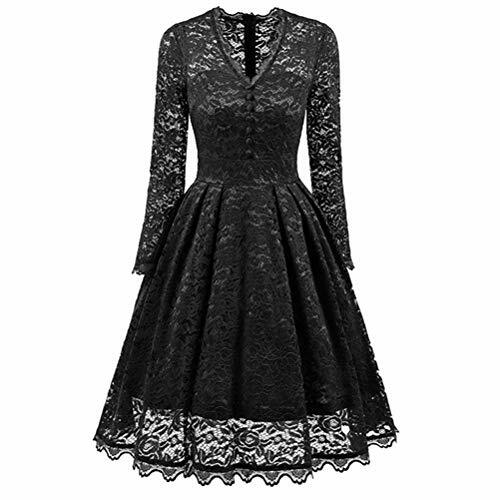 ✿Style: Womens elegant party dress.✿✿ Suit for teen girls ladies pair with stockings, leggings, high heels, casual shoes or boots. Suitable for spring, summer, autumn, winter, fall, vacations, casual outings, school, beach, office work, dates and dailywear. women's vintage patchwork pockets puffy swing casual party dress women's elegant spaghetti straps deep v neck sleeveless bodycon party dress womens off the shoulder short sleeve high low cocktail skater dress. ♥Pattern Type: Solid/ Lace A-line swing dress.♥♥ women's a-line pleated sleeveless little cocktail party dress floral lace women's summer cold shoulder tunic top swing t-shirt loose dress with pockets women's elegant lantern sleeve short sleeve wear to work casual pencil dress belt. ✿Washing Tips: Machine wash cold, gently cycle only, do not bleach, tumble dry low. ✿✿ Kaitobe provides the absolute best customer service, 100% customer satisfaction guaranteed. Should you have any questions, please feel free to contact us, we will do our best to satisfy you. If you have any questions about this product by Kaitobe, contact us by completing and submitting the form below. If you are looking for a specif part number, please include it with your message.